Fed up with Oil-bama and the BP Executive Elite? Feel like your voice isn't being heard? 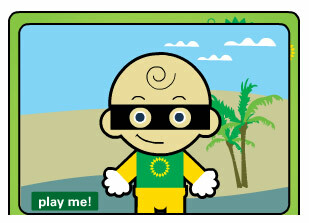 Send a baby mail, courtesy of BP's horribly cutesy "a little better gas station" campaign circa 2007. Choose one of four dumb babies, accessorize them, then baby-mail your political leaders or share it on your Boycott BP Facebook Page. I picked a bandit mask and a beach setting. Seemed appropriate. Then I selected a special message for Billy Nungesser, a Louisiana politician who's super pissed about the government halting his effort to block oil from the shore. No one can resist a message from a baby, so make your own and tell the do-nothings in Washington how you really feel! Bonus: Here's an old commercial featuring the BPabies. It's hard to remember a time when four perfectly diverse cartoon infants could drive around listening to KidzBop without worrying about burning turtles. I bet Tony Hayward jams this song on the yacht.